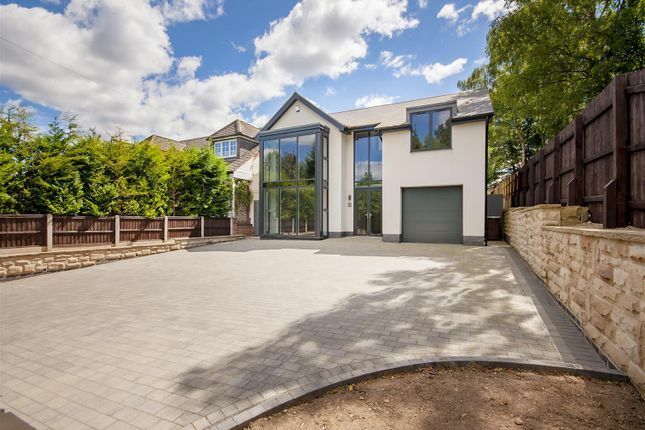 A striking and attractive, individually designed, modern, six bedroom detached house. An impressive full height atrium/hallway, large kitchen diner with family room and magnificent master bedroom with en-suite and balcony overlooking the rear garden. A truly individual, stylish and contemporary new build six bedroom, detached house in an exclusive and sought after location. This large and versatile house with accommodation arranged over three floors has a particularly impressive open plan atrium/hallway with floating stairs, open plan kitchen diner with seating area to the rear with twin bifold doors to the garden and a fabulous master en-suite bedroom with balcony overlooking the rear garden. In brief, the modern, appealing interior comprises spacious hallway/atrium, W.C, utility, study, sitting room and to the rear is a large open plan kitchen diner with seating area, to the first floor the property has a galleried landing, large master suite bedroom with balcony, further en-suite bedroom, two double bedrooms and a family bathroom, and to the second floor the property again has a galleried landing with two further double bedrooms. Outside, the property occupies a generous plot with a drive to the front providing ample car standing with the integral garage beyond, and to the rear the property has a private and mature generous garden with patio, lawned area and mature shrubs and trees. Occupying an enviable position within Cow Lane, ideally placed for easy access to Beeston town centre and the A52, this fabulous property is a rare opportunity that can only be truly appreciated through viewing. Twin double glazed entrance doors lead to the particularly impressive, spacious, full height atrium/hallway with tiled flooring and floating staircase up to first floor level. W.C, wash hand basin inset to vanity unit with tiled splash back, tiled flooring and extractor fan. With a modern fitted kitchen comprising work surfacing, one and a half bowl sink with mixer tap, induction hob with air filter above, double oven and combination microwave oven, integral dishwasher, tiled flooring, inset ceiling spotlights, double glazed twin bifold doors to the rear garden and two UPVC double glazed window. UPVC double glazed window and tiled flooring. Tiled flooring, inset ceiling spotlight and a feature, full height double glazed window. Base units with work surfacing, one and a half bowl sink with mixer tap, wall mounted main combination boiler for domestic hot water and heating, UPVC double glazed door, tiled flooring and extractor fan. N.B potential purchasers should note that the ground floor has underfloor heating. With a particularly impressive galleried landing overlooking the hallway, inset ceiling spotlights and floating stairs up to second floor level. Two radiators, patio door leading out to the balcony overlooking the rear garden and UPVC double glazed obscured window to the side. Twin wash hand basins set upon a granite plinth, W.C, shower cubicle with mains overhead shower and further shower handset, fully tiled walls, tiled flooring, wall mounted heated towel rail, inset ceiling spotlights, extractor fan and UPVC double glazed window. 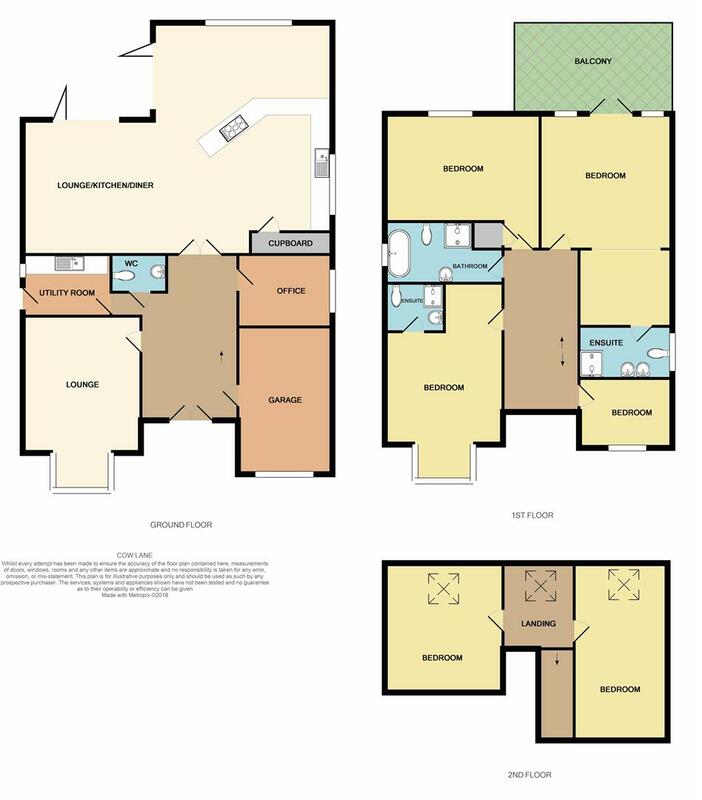 With a feature, part vaulted ceiling, double glazed window, radiator and inset ceiling spotlights. With modern fitments comprising W.C, shower cubicle with Bristan shower, wash hand basin inset to vanity unit, fully tiled walls, tiled flooring, wall mounted heated towel rail, extractor fan and inset ceiling spotlights. UPVC double glazed window, radiator and airing cupboard housing the hot water cylinder. Velux window and inset ceiling spotlights. Velux window, radiator, eve storage and further fitted cupboard. To the front, the property has a walled boundary with a block paved drive providing ample car standing with the integral garage beyond. There is a walled raised border and gated access to the rear of the property. To the rear, the property has a large and impressive landscaped garden, which comprises of patio, ideal for family life or entertaining with power points and outside tap. Beyond the patio is a large, lawned garden with mature shrubs and trees. Remote controlled up and over door to the front, tiled flooring, light and power.